Let's Dance - Kairos Alive! For almost 40 years, I’ve labored in the health care industry, working as a physician committed to improving the health of the patients I cared for. My efforts were directed to addressing the health needs of those I saw……but with a focus on a medical model. Several years ago, I became associated with the Kairos Alive group, and began to realize that I had a narrow, limited focus on what would improve the health and well being of those around me. Recently “retired” from my formal role in the health care industry, I was persuaded to take on the role of Board Chair for Kairos Alive. 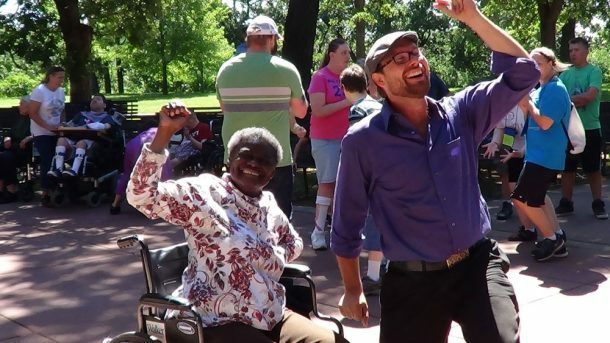 Initially I planned on limiting my support to helping them connect with those I knew from my past health care experiences, but primarily serving as a catalyst for supporting their work in using dance, music, stories, and movement to improve the well being of the citizens they cared for. While initially primarily involved with elderly residents of various long term care facilities, they persisted in their efforts to convince me their work applied to all. Oh, and they continued to encourage me to participate in one of their Dance Hall experiences, sharing in the joy and excitement they told me they brought to those attending such events. After much prodding, I agreed to travel to the VA Center in south Minneapolis, and participate with them in bringing their energy, passion, joy, and engagement to residents and patients across the VA Center. As I walked into the room, I saw (at least from my initial reaction) a quiet, reserved group of people, some slumped over in their chairs, with often glum, sad looks dominating the room. “Oh, boy, do we have a challenge tonight!” crossed through my mind. Ninety minutes later, everything had changed. To the accompaniment of a small instrumental group, and the energy of the Kairos Alive staff, I was dancing, singing, perspiring, and watching a room come alive, with smiles, upraised voices, dancing (both while seated, while dancing, and in some cases through mobile wheelchairs), and smiles of joy and memories permeating the room, both from the residents, but also from those of us lucky enough to be a part of this experience. It left me with a feeling I’ve rarely experienced, a fulfillment, a sense of really making a difference, in ways I’d not expected. I’m more committed than ever to supporting the Kairos Alive approach in bringing joy and wellbeing to those in our community, but not just through my role as Board chair. Come on, let’s dance, it’s an amazing opportunity to give back to the community in which we live. See you at the next Dance Hall, I hope.